Hosts Arizona Bell and Morgan Garza welcome Mark Anthony the Psychic Lawyer/Psychic Explorer to Spirit Guides Radio. Spirit Guides Radio delves into all facets of what it means to live a spiritual life in the 21st century, in a charming and accessible way. Each week Spirit Guides Radio will explore a specific topic—anything from astral travel to mediumship to aura fields—that will include brain-picking an expert guest in that field. Join us while we investigate the invisible forces of Spirit through evidence-based thought and discussion. No “woo” here, just wow! Arizona Bell is the co-founder and editorial director of Spirit Guides Magazine. Arizona has written extensively for newspapers, magazines, websites, and businesses, including The Los Angeles Review, The Establishment, Grief Digest and Curve Magazine. Morgan Garza is the co-founder and growth director of Spirit Guides Magazine. She has a soul that is ravenous for the curiosities of life, the universe, and unconditional love. Extensive travel has expanded her mind and deepened her compassion for humanity and the infinite ways we express our passion and purpose. 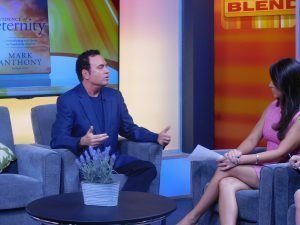 TODAY their special guest is Mark Anthony the Psychic Lawyer® (aka Psychic Explorer®) the author of the award winning, critically acclaimed best-sellers Never Letting Go and Evidence of Eternity. He is a world-renowned fourth generation psychic medium who communicates with spirits. Mark is an Oxford educated attorney licensed to practice law in Florida, Washington D.C. and before the United States Supreme Court. Mark is featured regularly on Television, major talk radio shows and in print media. Mark is a headline speaker at conventions, expos and spiritual organizations such as the Edgar Cayce A.R.E., International Association of Near-death Studies & universities including Brown, Columbia, Harvard & Yale. Mark Anthony will be taking calls from listeners and conducting readings on air.